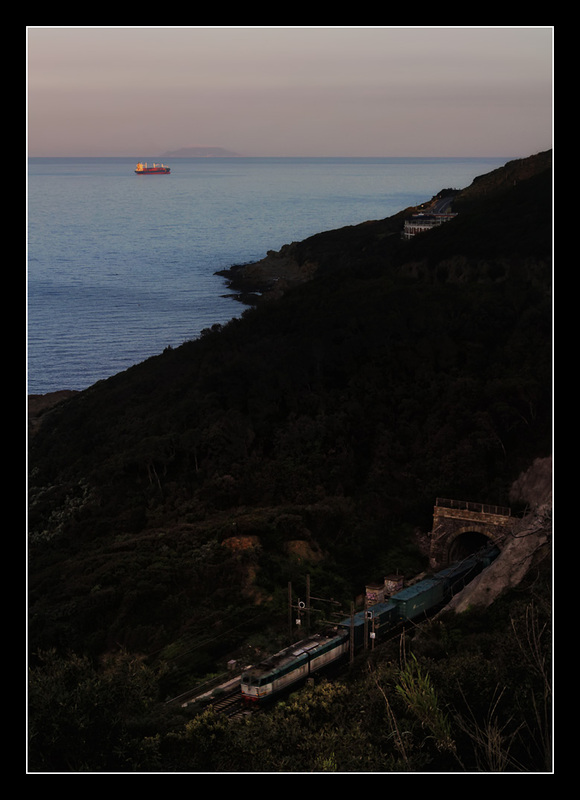 Once more I started on the first train of the day, this time I wanted to capture the morning mood along the coast. 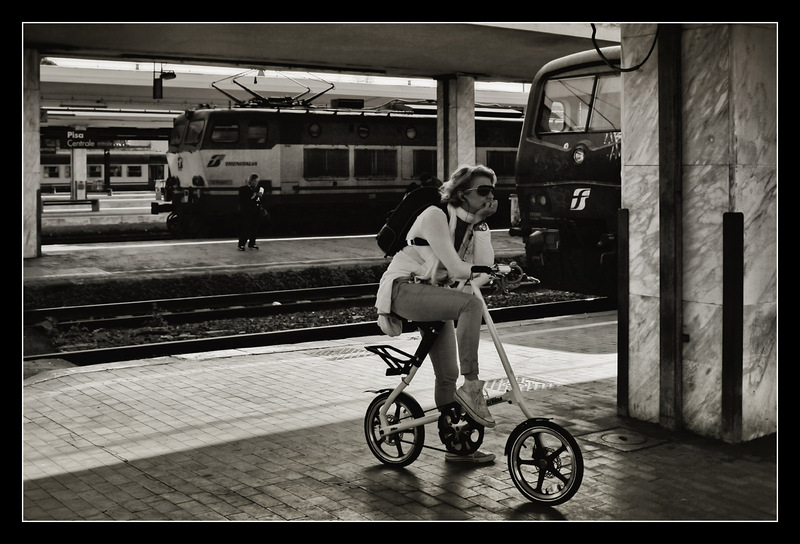 I rode to its terminal Livorno and subsequently took a taxi for 8 Euro to Largo del Duomo square, where my bus was about to depart. The bus ticket itself cost 1.70, however, the first bus driver was not able to give change. 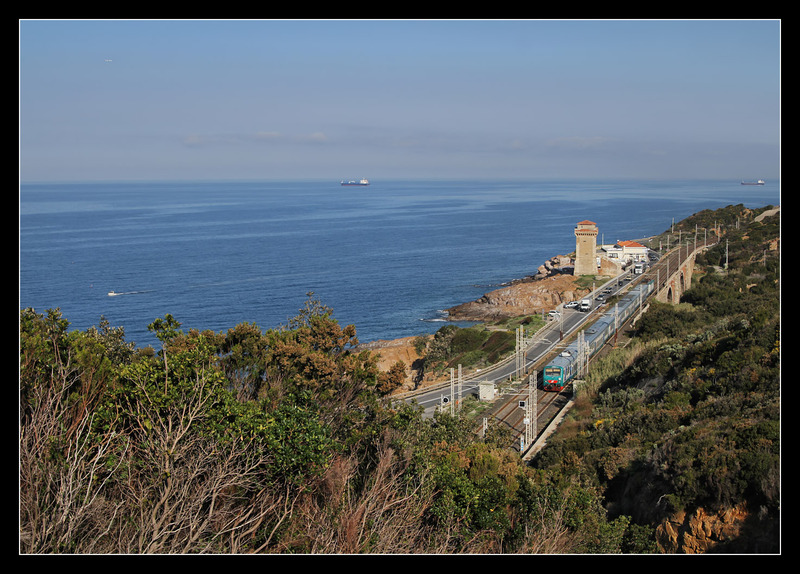 First we drove through Livorno suburbs, then followed the coastline to Castel Sonnino, a neo-medieval castle built in the 19th century. I got off, here you could only follow the main coast road with appalling morning traffic. Obviously no bypass had been built yet. While I was waiting, amongst others a mobile crane, a Ford Mustang and some female cyclists pedalling uphill passed by. 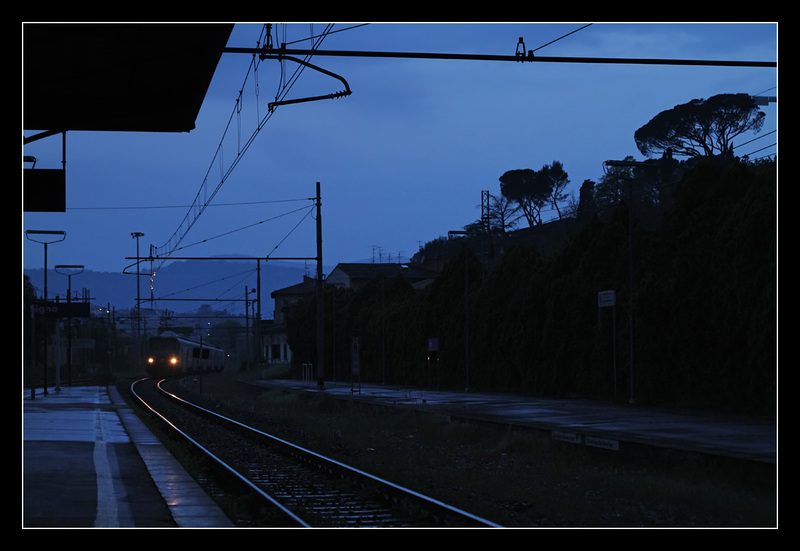 Thankfully R 3104 showed up at 7:15, an InterCity sped past towards Rome and Naples a few moments later. Far away slightly visible in the haze was the island Capraia and behind it already Sardinia. 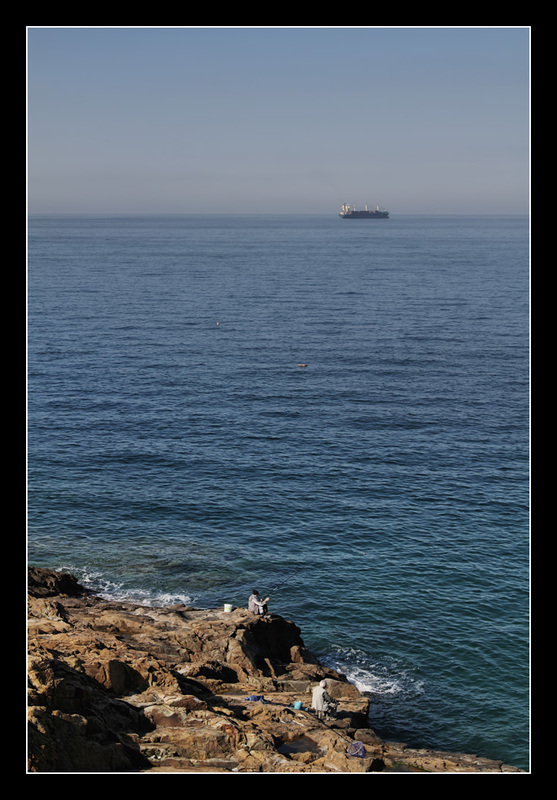 Situated further north and more closely to the coast Gorgona island still wore a foggy cap. Waiting at the bus stop I hoped for one more train, and really! A class E655 with freight did not disappoint. 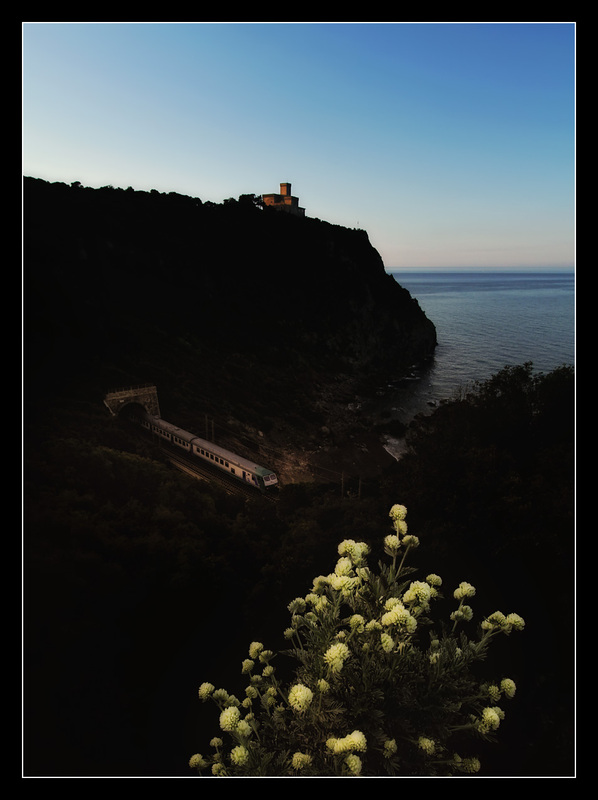 I took the next bus to the best known photo spot near Livorno, Calafuria. 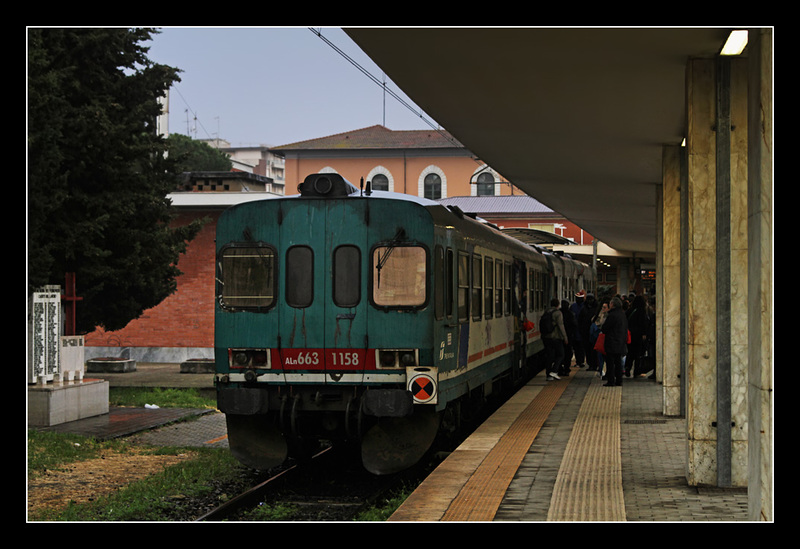 Soon Frecciabianca 9761 to Roma Termini rushed past. I had to search a while until I found the entrance of the path across the tunnel. 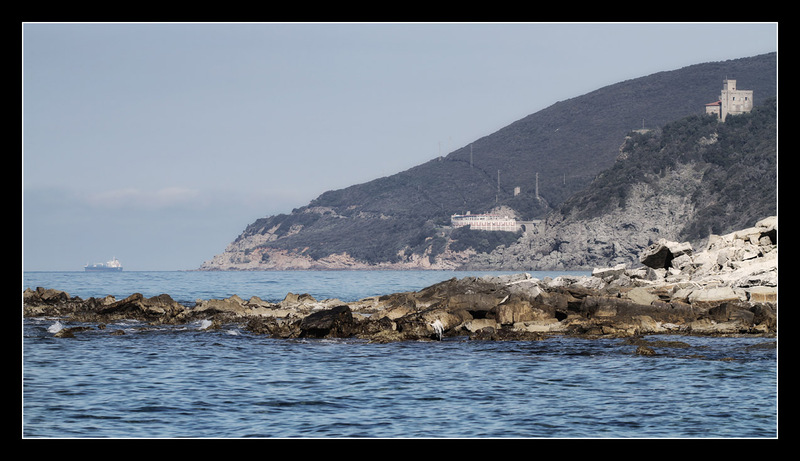 I climbed uphill across slippery rocks surrounded by very dense macchia taller than me. There was no getting through off-path here. Once above the tunnel you had to follow a rock face, other than that I only gained a view once I reached the spot. The classic viewpoint is situated further ahead, but it seemed quite overgrown to me and I liked this one better. 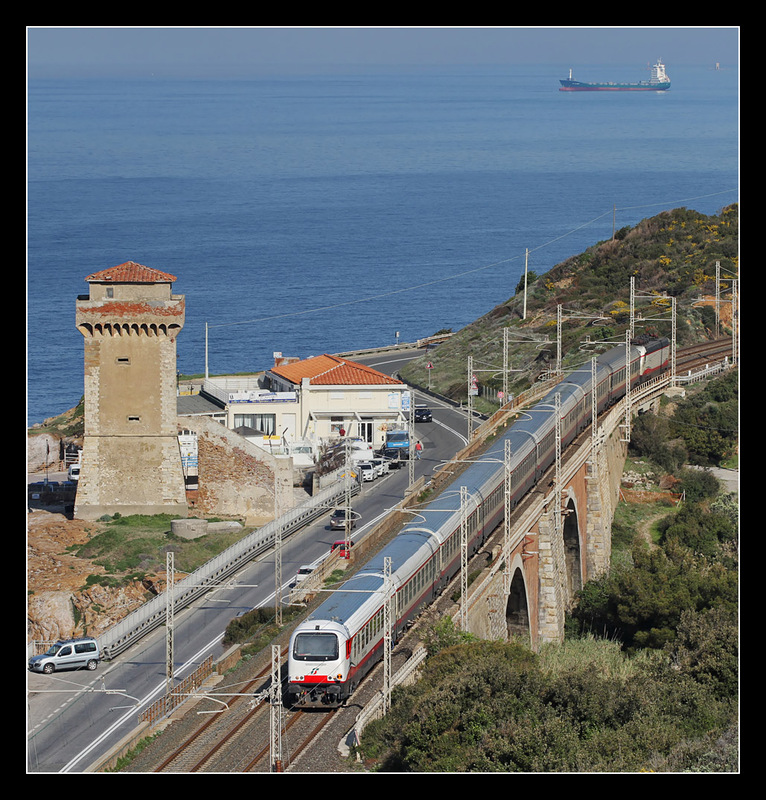 Soon a single class E655 rolled past towards Livorno. 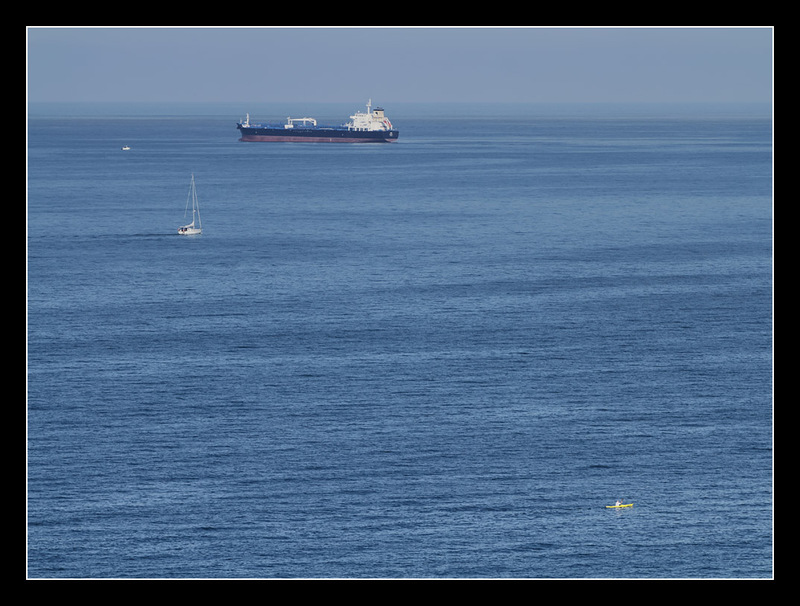 Ships sailing from port offered entertainment during gaps between trains, such as this ferry to Corsica here. 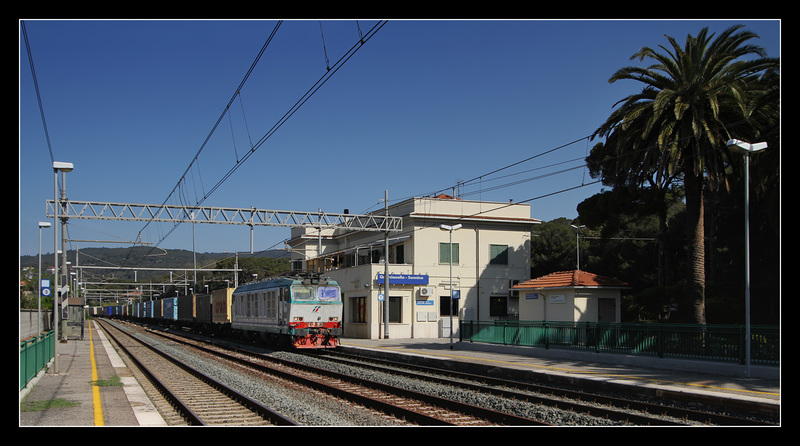 I was looking forward to FB 9763 as conclusion - when I remembered: I already had caught the same train at La Spezia a few days before, this was no class ETR460 but a push-pull rake. Oh well, some change is nice, too. Next I climbed down the path. I took a southbound bus, at Quercianella a few African traders got on. 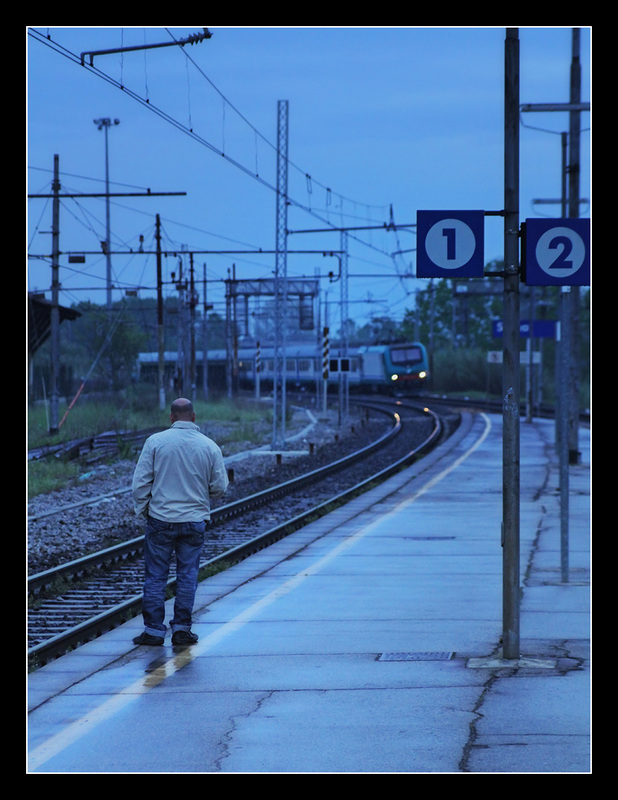 However, I missed the bus stop next to the train station and got off at the following one. As this became publicly known a "Mamma mia"-murmur went through the bus passenger crowd. 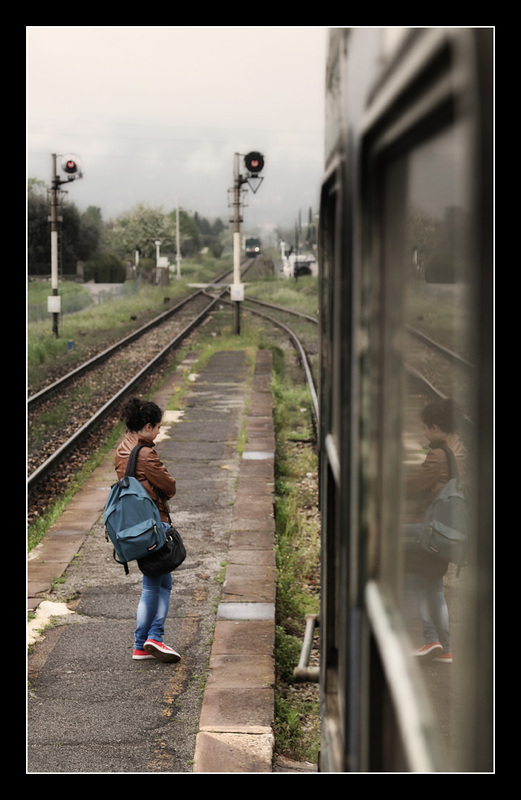 For me it was not too bad, there still remained plenty of time until the next train would depart, and that way I could walk along the seashore. At least theoretically, as almost all the coastline had been built up by private owners, only one flight of stairs led through the cliffs to a small public pier. I used the opportunity to touch sea water the only time this trip. 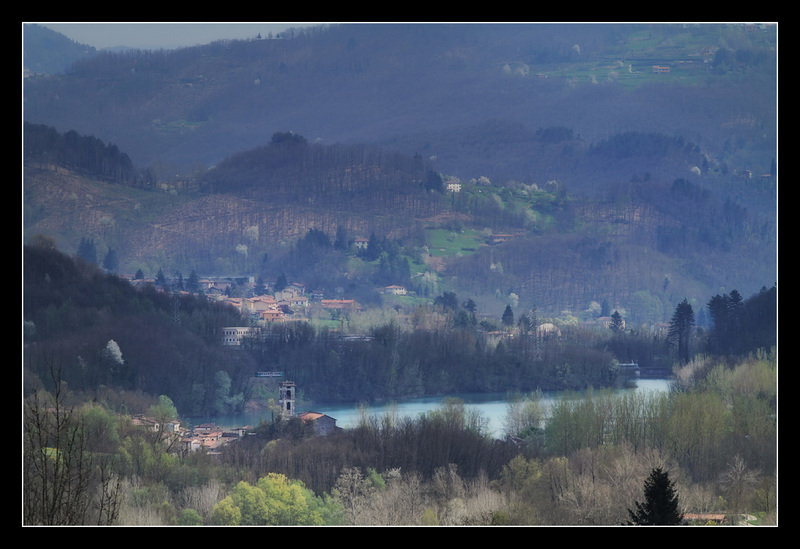 The spot also offered a view towards Castel Sonnino. 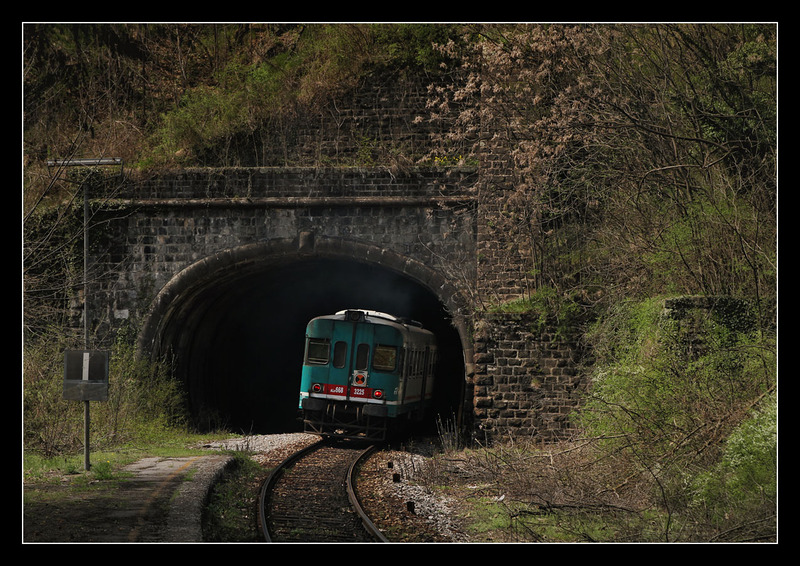 The railway line stayed hidden, it was cut too deeply into the hills and only saw daylight here on very short sections. 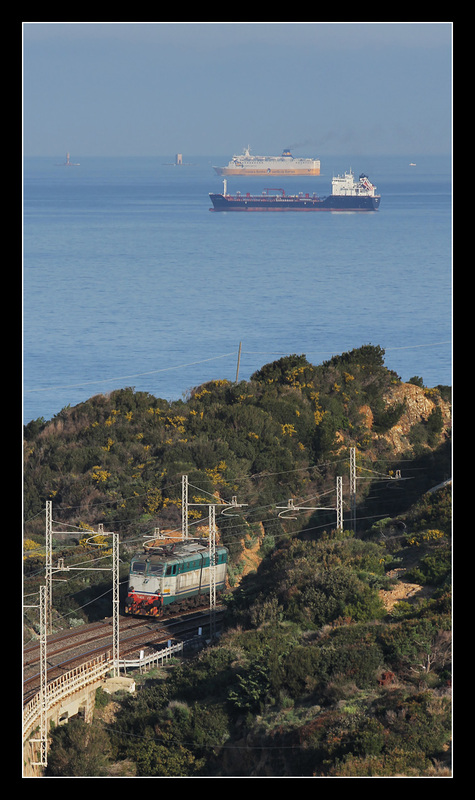 I reached Quercianella-Sonnino and was soon happily surprised by a class E652 hauling a container train. Only one more passenger waited for R 3110 to Pisa, traffic was sparse here by day. At Livorno a Canadian couple took their seats opposite me, while leaving the station I saw a class D345 shunting near the harbour. 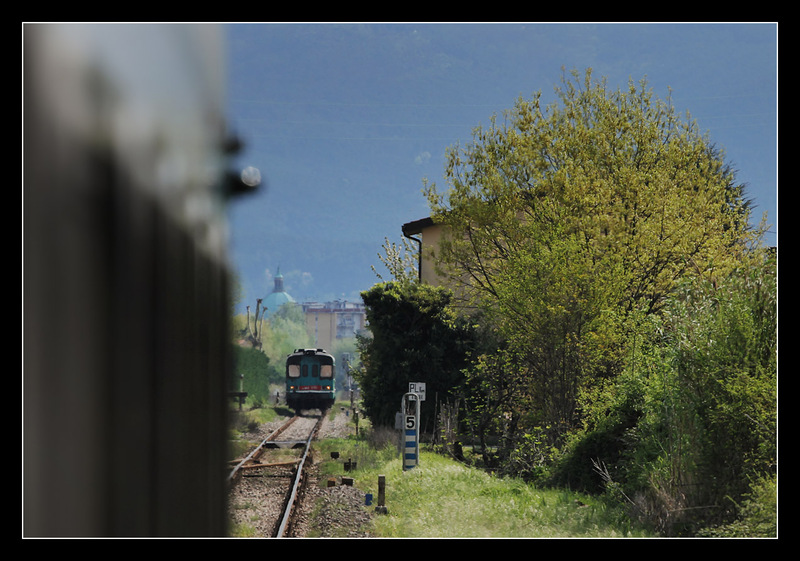 I spent an hour at Pisa Centrale then embarked on this "photovoltaic" Aln668 towards Garfagnana. 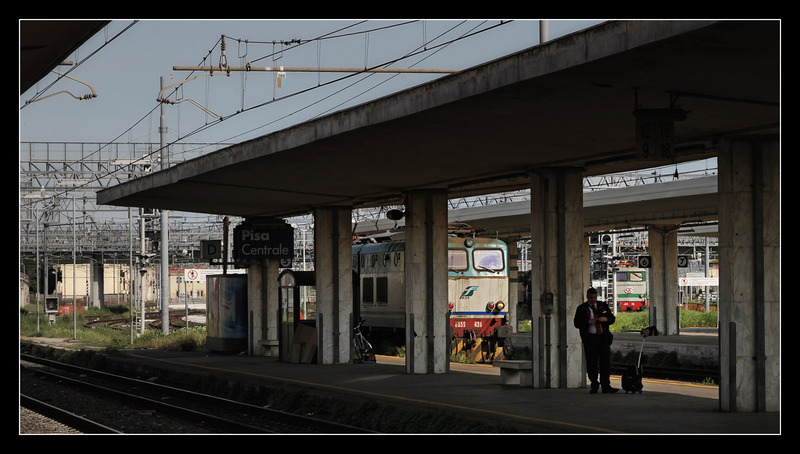 At Pisa San Rossore a few British tourists got on the train talking about various things, from their first Beatles-concert, to the Dawlish Seawall to Michael Portillo. 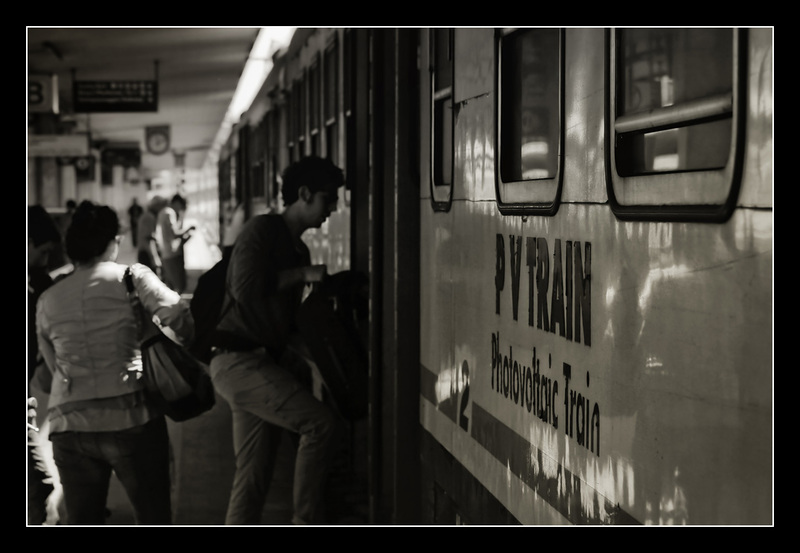 The railbus was also well frequented by pupils. 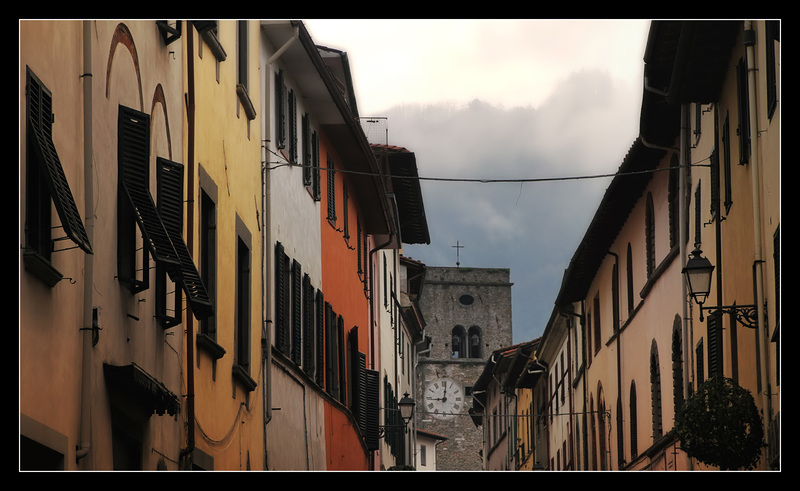 The same rake was about to continue, still I took a look around at Lucca. D345 1127 was shunting here sporting the new livery. We entered the mountains, my father and I already had hiked here in the 90s. 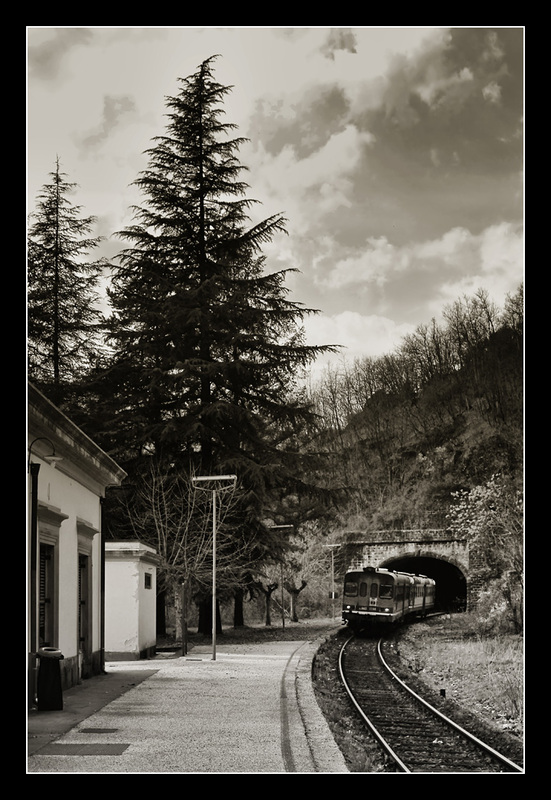 Fosciandora-Ceserana was located one station ahead of the region's main place Castelnuovo. 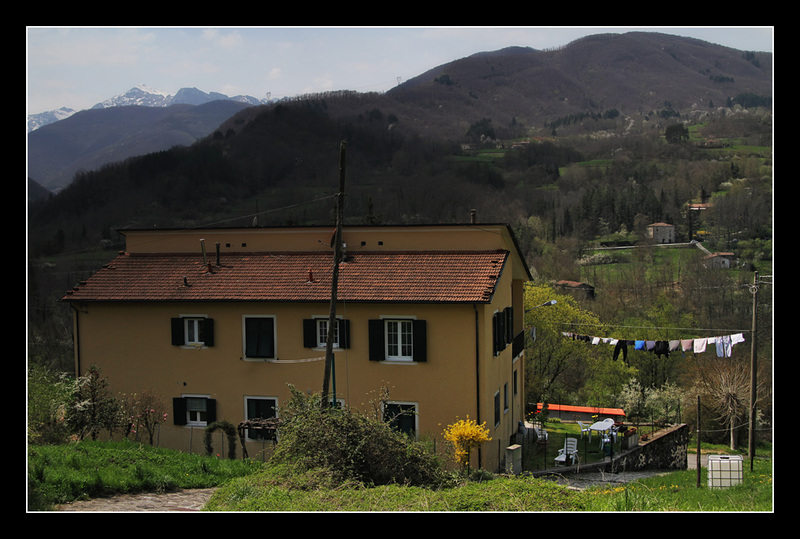 At Castelnuovo di Garfagnana we crossed R 6969 from Aulla Lunigiana, which continued from Lucca as R 6770 to Pisa. On this line mainly class Aln663 featuring a more modern front operated. 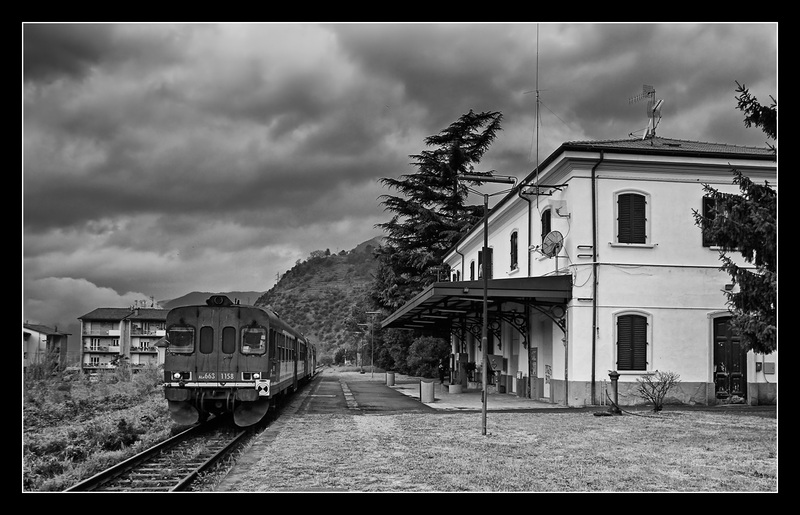 The station had been built in 1911, up to 1940 it was the terminal until the section to Piazza al Serchio had been completed. 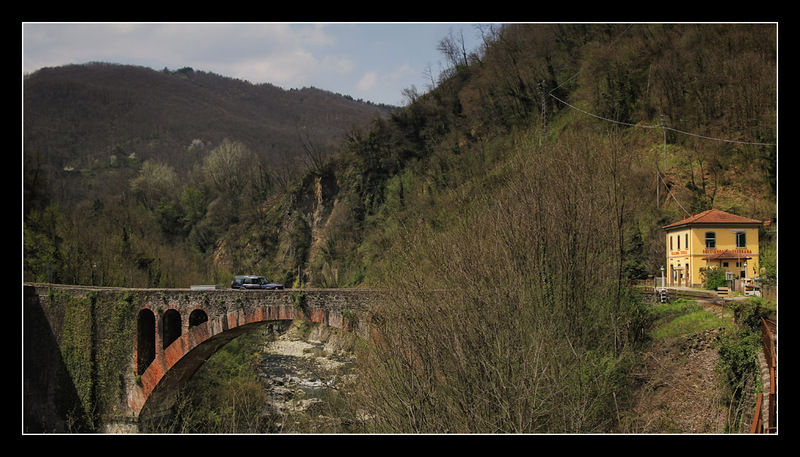 The reason can be seen for example here, this giant viaduct between Villetta-San Romano and Poggio-Careggine-Vagli. 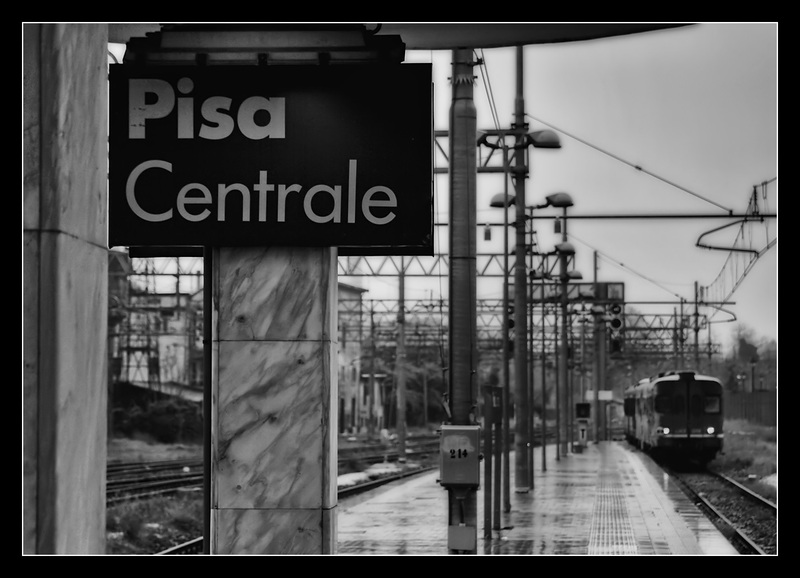 The completion of 4,6 miles long Galleria del Lupacino behind Piazza al Serchio led to the final gap closure of the line only in 1959. The - nowadays - stop is located between two tunnels. 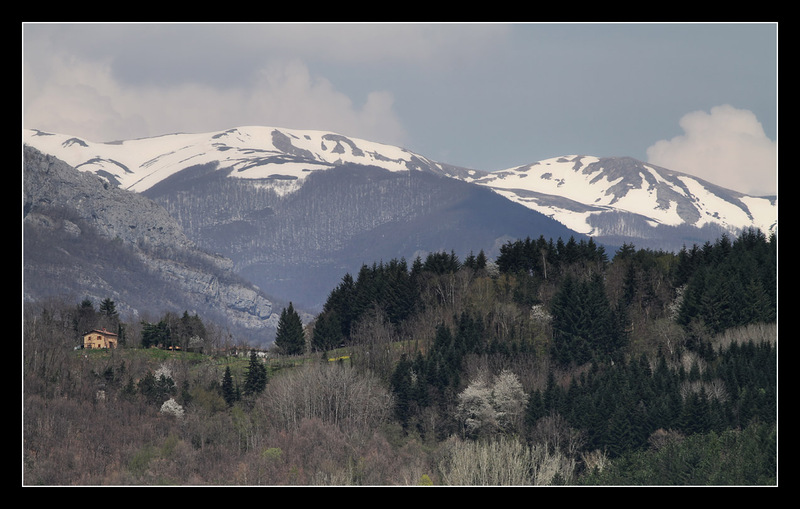 Now you found yourself in a neighbouring valley and had to climb steeply to reach the village on a crest. 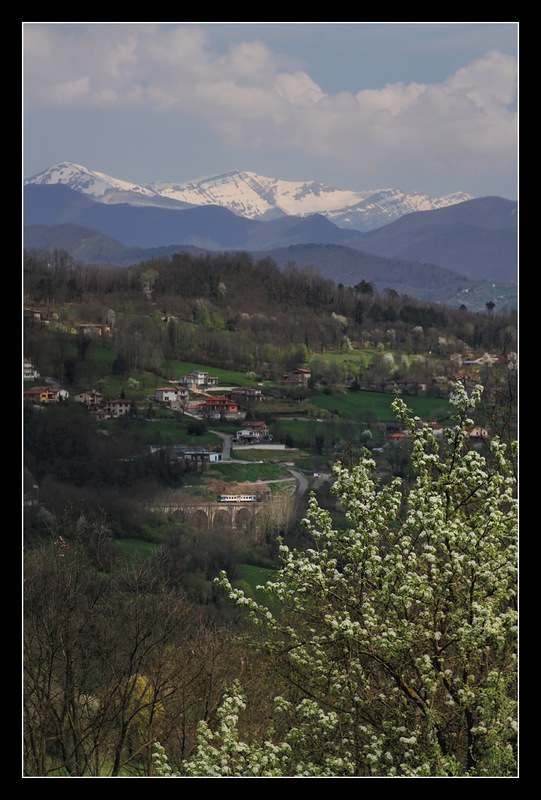 The way featured lovely glances back at snowy peaks of the Apuan Alps. 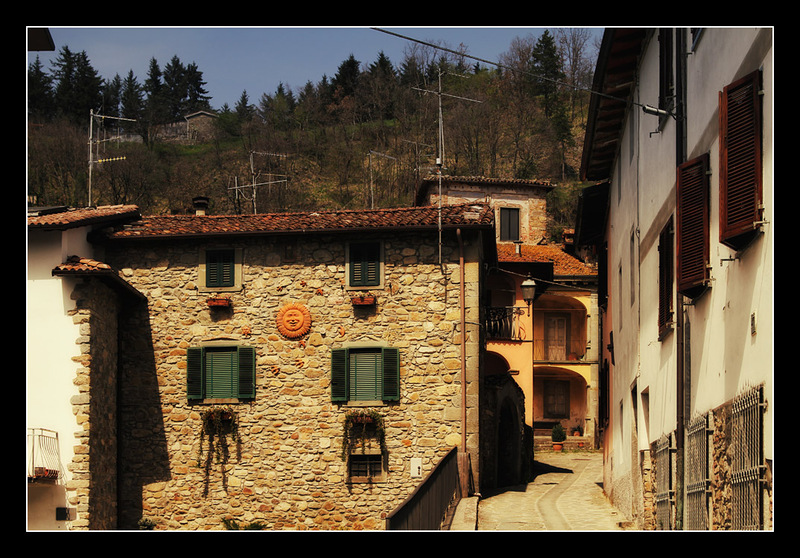 Next I traversed the picturesque place to reach the main street. Just outside the village the panorama looking east opened up. 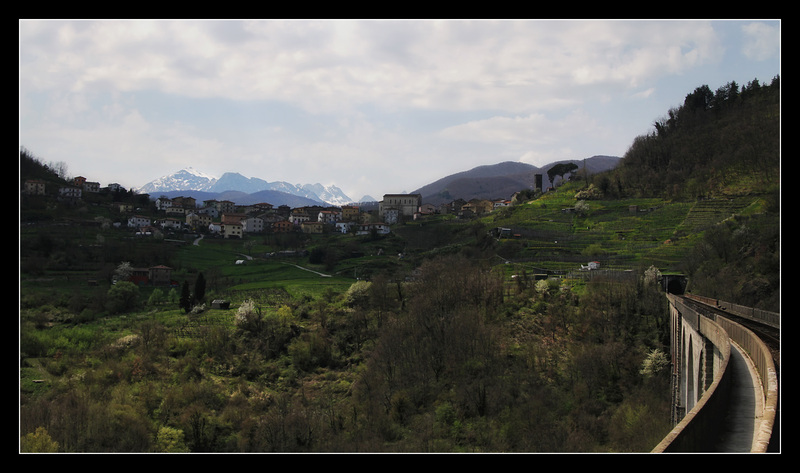 And finally crossed the Serchio. 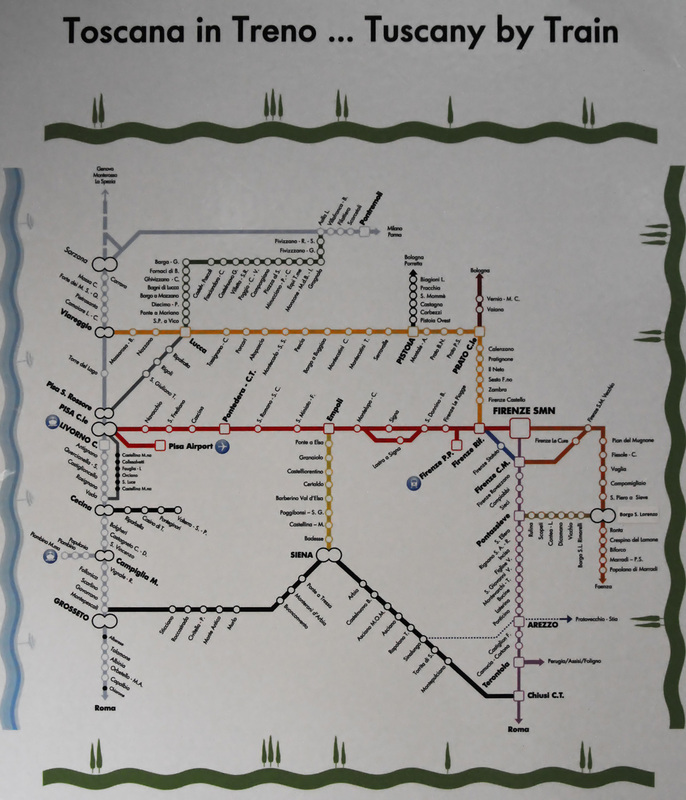 Actually the single railcar proved quite useful, the dimensions were represented that way much more impressively. 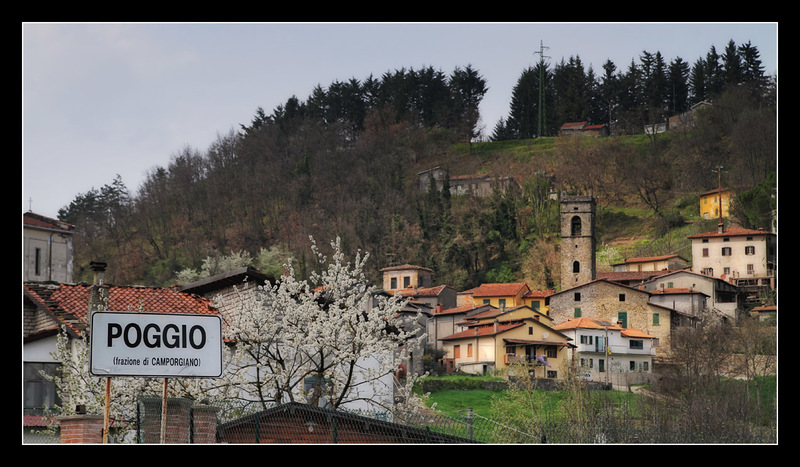 For the panorama I climbed a streetside wall outside Poggio. 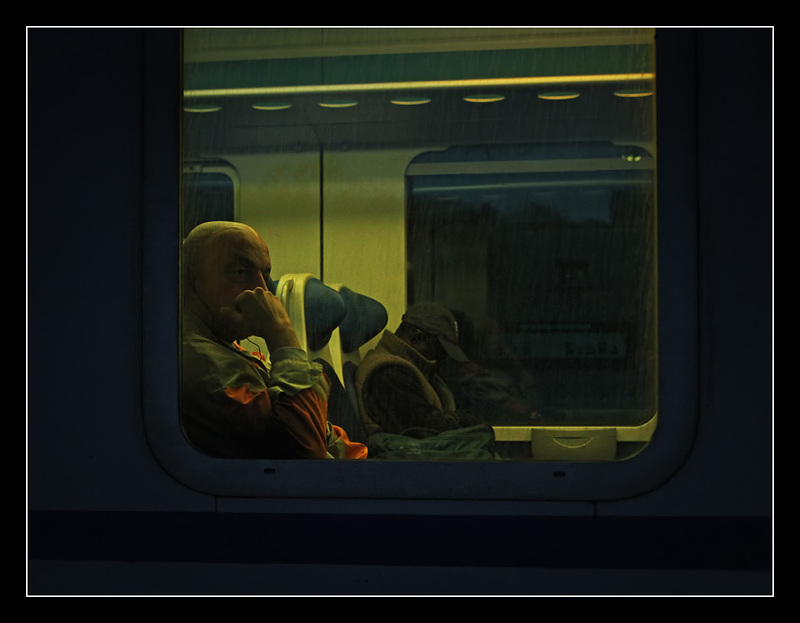 Combined rail-, laundry- and balcony-photography. After the efficient session I marched back to the station. R 6971 picked me up ten minutes delayed. 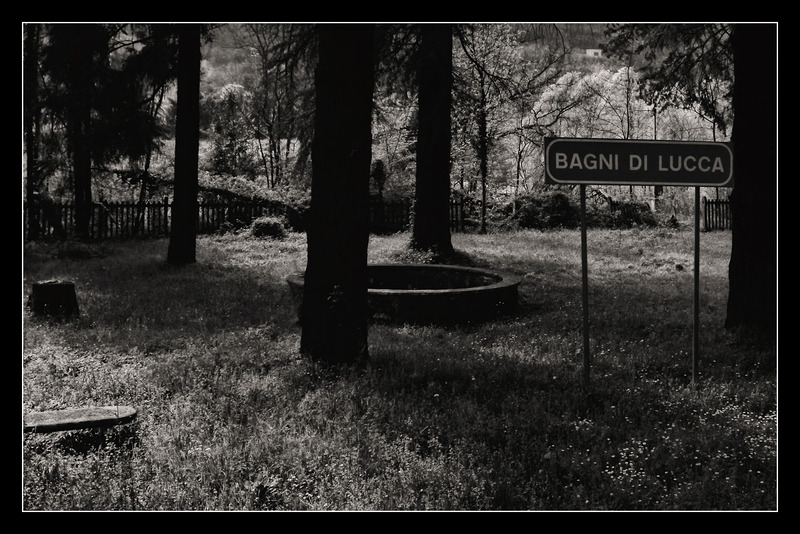 Along Lago di Pontecosi we passed another well-known photo spot, the adjacent station already had been closed in 2002. Rural idyll halfway between Castelnuovo and Lucca. 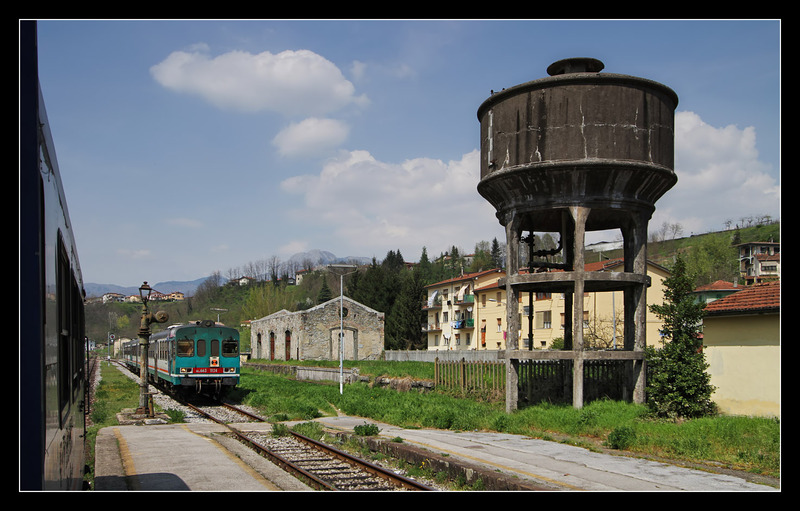 Cheered too soon: Out of some reason the next train crossing us spent an eternity on the long straight between Lucca and the first station San Pietro a Vico. Finally we arrived 10 minutes delayed - the connecting class ALe642 would have been gone, but it did depart with an identical delay, so everything worked out fine. 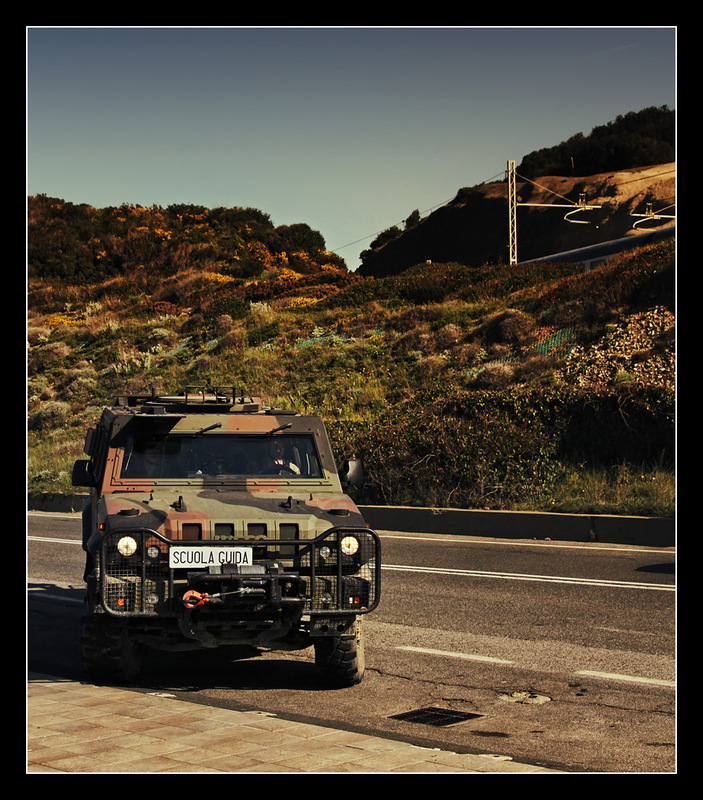 At least in Italy advertisements show courage to embrace diversity. 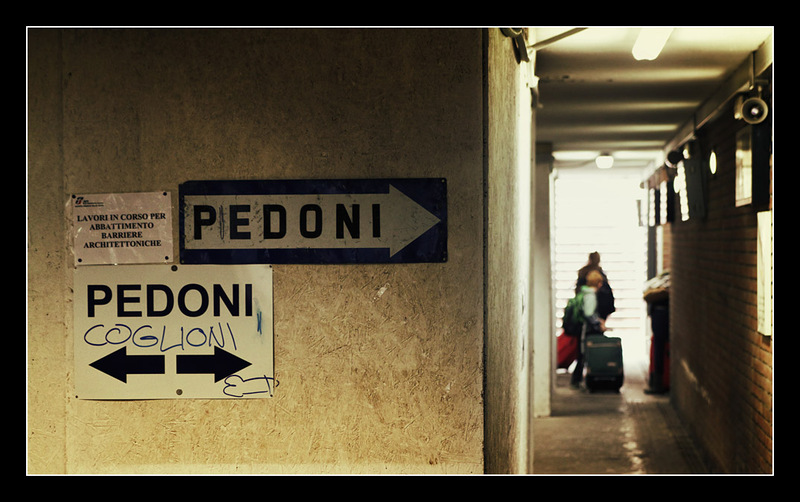 Entering Pisa we raced the also five minutes delayed regional train from La Spezia. 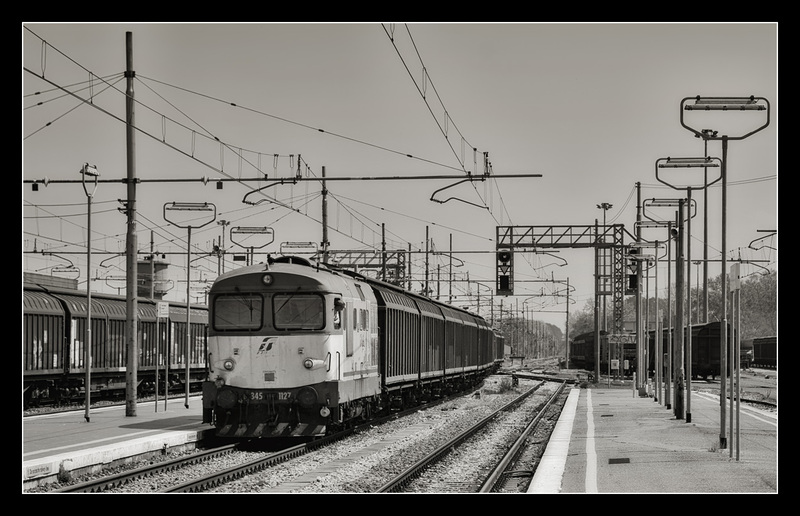 Meeting of classic electrics at Pisa Centrale: heritage loco E646 196 was shunting the nostalgic rake for the next day, while freight engine E655 426 rolled past the platform. I reached Signa relatively punctually and called it a day after the nth early morning of the trip. Only the owner of the hotel knocked on my room door once, the receptionist had forgotten the tourist tax on the bill. On departure day I had known in advance it would be the only one with rainy weather - until now hardly a cloud had shown up all week. 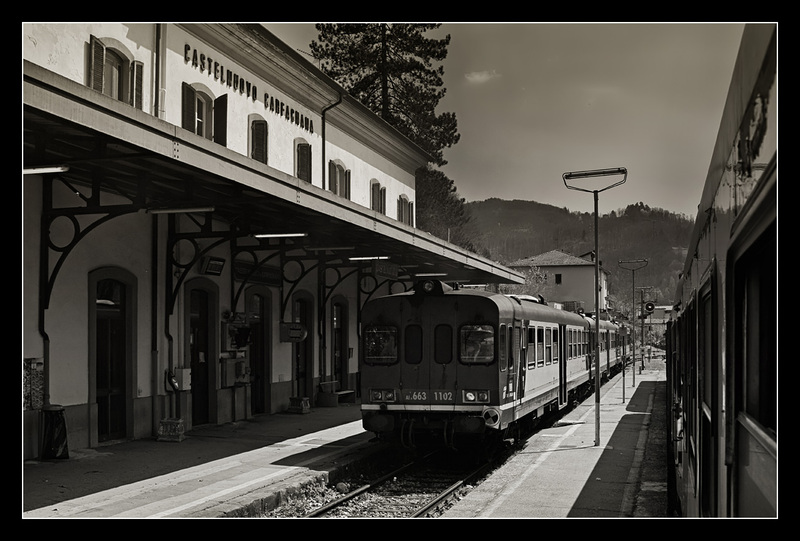 I wanted to catch the steam train, so a slightly later departure from Signa was possible. I left my luggage in a closet behind reception and reached the station shortly before half past six. My R 11705 from Florence towards Pisa approached around the curve. 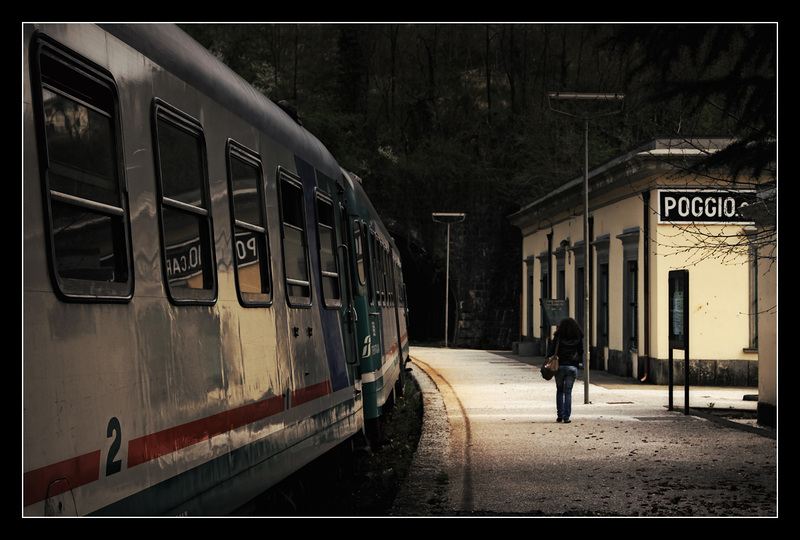 At Pisa I once more caught a direct train to the Garfagnana consisting of a mixed double. This time we departed from a dead end track. 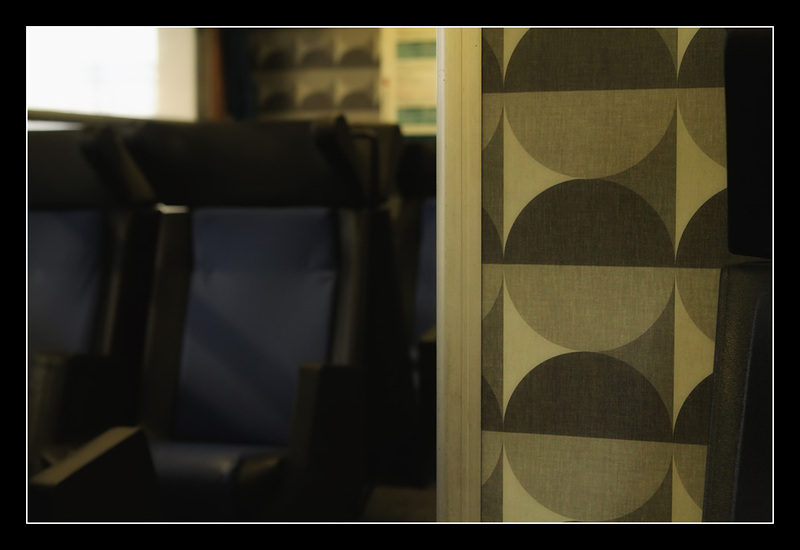 All class ALn668 I had travelled with had received renewed interiors, this class ALn663 still featured the original 1980s-design. 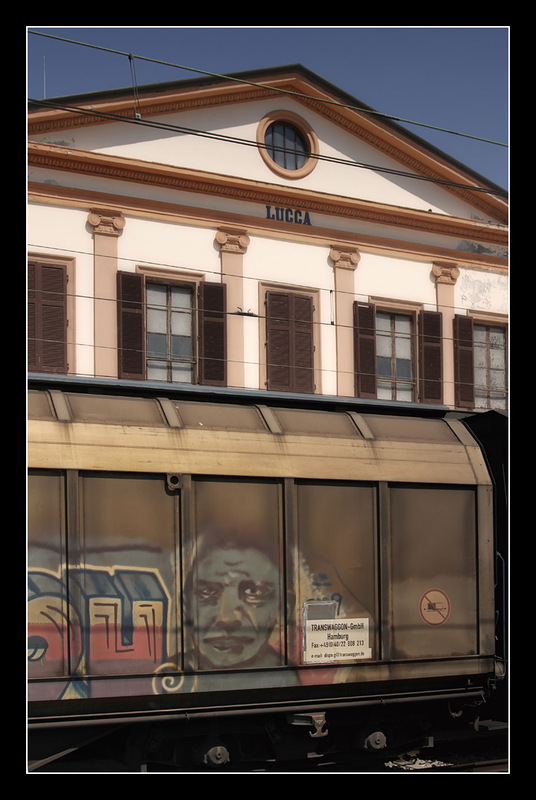 While riding the train to Lucca some passenger listened to a loud prayer via radio. 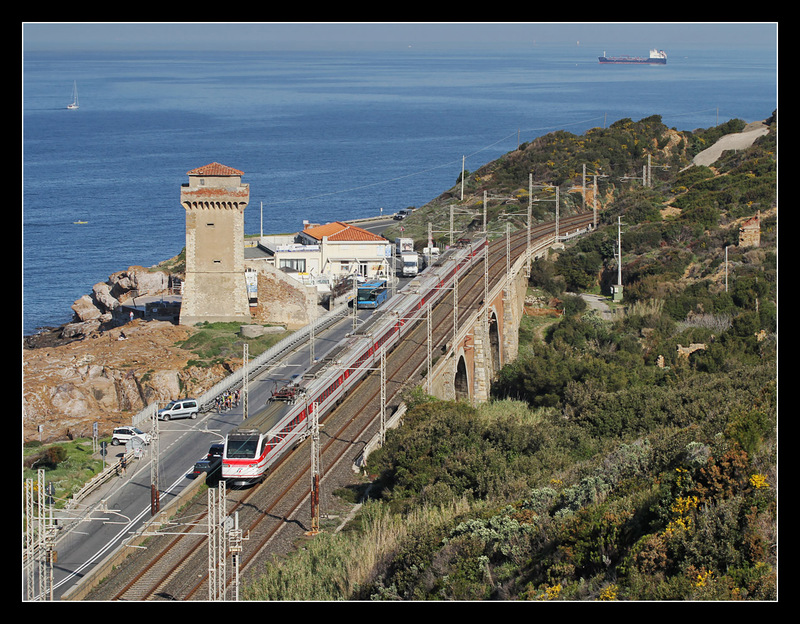 Once more we crossed a train at San Pietro a Vico. 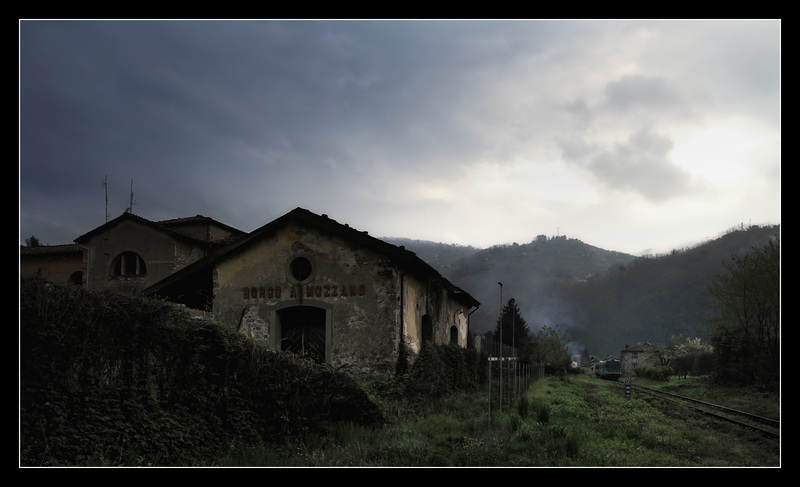 I got off at Borgo a Mozzano. Above the hills the sun was just showing magnificently through the clouds. 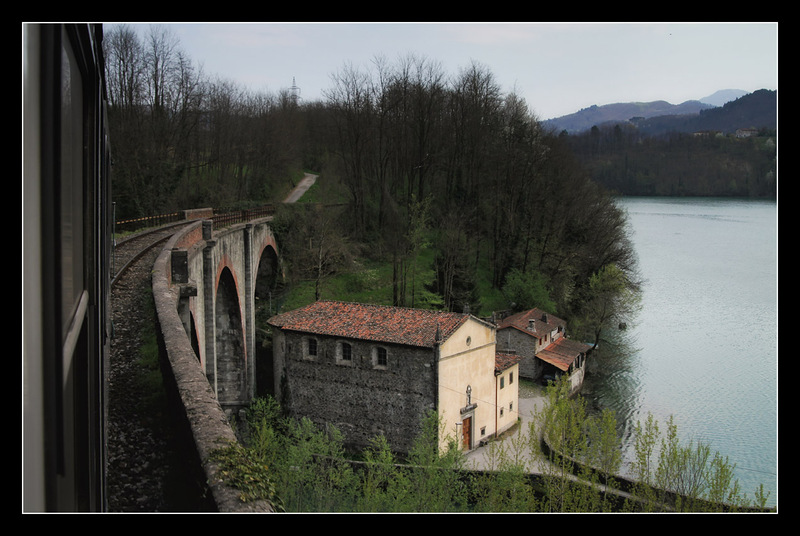 Next time I will already present the final part of the trip featuring the steam train at the Devil's Bridge and a wonderful last evening in Florence.